After the ONZ Champs at Labour Weekend November was perhaps always going to be a bit of an anti-climax despite both the AOA and WOA Champs being on the calendar. Brief reports on both are below. Also revealed is the draft programme for the 2018 SuperSeries, and some reflections based on two weeks in Norway on winter training in Scandinavia. The 2018 Auckland Championships returned to the limestone country of Onewhero including an imaginative sprint among the outcrops of the rockery. In what were, in the aftermath of the ONZ champs, relatively small fields, M21E all three races turned into a tussle between Matt Ogden and Gene Beveridge, Gene taking wins in the sprint and long but bowing to Matt in the middle distance. Interestingly, had it been a three-day event with cumulative times counting Matt would have prevailed by 32 seconds overall. In W21E there was the welcome return to competition of Lauren Holmes, but Renee Beveridge, was unchallenged in winning all 3 races. There was more competition In M20 where Daniel Monckton, Tommy Hayes and Callum Hill all took turns as the top Kiwi, although visiting Swiss Silvan Ullman was the winner in both the middle and long distances. Lara Molloy took out two titles on the Saturday in W20, with another Swiss Eveline Husner, although running for Auckland, winning the long. M21E, 4.1k: 1. Matt Ogden (NW) 34:22, 2. Gene Beveridge (NW) 37:58, 3. Cameron de L’Isle (NW) 40:47. W21E, 3.9k: 1. Renee Beveridge (NW) 48:20, 2. Lauren Holmes (NW) 1:16:18. M20, 3.9k: 1. Silvan Ullman (SUI) 39:21, 2. Daniel Monckton (NW) 41:39, 3. Ryan Williams (AK) 45:13. W20, 2.9k: 1. Lara Molloy (WN) 35:10, 2. Eveline Husner (AK) 38:37, 3. Hayley Smith (AK) 47:29. M21E, 1.9k: 1. Gene Beveridge 10:14, 2. Matt Ogden 10:29, 3.Jonas Klausen Espedal (NOR) 11:19. W21E, 1.58k: 1. Renee Beveridge 15:46, 2. Lauren Holmes 21:56. M20, 1.9k: 1. Tommy Hayes (AK) 10:22, 2. Kurtis Shuker (CM) 11:25, 3. Thomas Stolberger (NW) 15:02. W20, 1.58k: 1. Lara Molloy 16:22, 2. Hayley Smith 18:39, 3. Eveline Husner 22:02. M21E, 9.1k: 1. Gene Beveridge 1:18:30, 2. Matt Ogden 1:21:19, 3. Scott McDonald (HB) 1:22:36. W21E, 6.9k: 1. Renee Beveridge 1:25:50. M20, 6.9k: 1. Silvan Ullman 57:42, 2. Callum Hill (NW) 1:04:24, 3. Tommy Hayes 1:10:16. W20, 5.4k: 1. Eveline Husner 1:13:23, 2. Heidi Stolberger (NW) 1:24:30, 3. Hayley Smith 1:27:45. The following week after the AOA Champs it was WOA’s turn. Overall the turn-out was smaller than in Auckland although the size of the elite fields was slightly larger. The sprint distance returned to Raumati, used first for the WRE held as part of Waitangi 2016, and saw an excellent run in M21E by Joe Lynch behind top Swiss Florian Schneider, but ahead of Silvan Ullman. W21E was largely populated by juniors running up and Marina Comeskey had a narrow 2 second victory ahead of Lara Molloy with another JWOC representative, Jenna Tidswell in 3rd. The afternoon middle distance was in the track laden native bush of Maungatukutuku (over one range of hills behind Paraparaumu). The unfamiliar green of New Zealand bush was clearly no hindrance to Florian as he had a clear victory over Silvan with Joe some way back in 3rd. In W21E Jenna took revenge on Marina with Sarah O’Sullivan striking a blow for the more established 21’s in 3rd place. M21E, 3.58k: 1. Florian Schneider (SUI) 14:07, 2. Joseph Lynch (WN) 15:28, 3. Silvan Ullman (SUI) 15:42. W21E, 2.88k: 1. Marina Comeskey (WN) 14:59, 2. Lara Molloy (WN) 15:01, 3. Jenna Tidswell (HB) 15:22. M20, 3.58k: 1. Stefan Prychodzko (HV) 17:25, 2. Sam Middleton (WN) 31:33. W20, 2.88k: 1. Rebecca Grant (WN) 18:54, 2. Emma Carruthers (WN) 19:40, 3. Alexandra Riddle (HV) 21:38. M21E, 3.1k: 1. Florian Schneider 27:44, 2. Silvan Ullman 30:38, 3. Joseph Lynch 36:59. W21E, 2.8k: 1. Jenna Tidswell 38:08, 2. Marina Comeskey 39:15, 3. Sarah O’Sullivan (WN) 39:27. M20, 2.8k: 1. Sam Middleton 56:40. W20, 2.4k: 1. Lea Leuenberger (SUI) 37:26, 2. Rebecca Grant (WN) 38:34, 3. Emma Carruthers 44:29. Sunday’s WOA long distance returned to the beautiful fast sand-dunes of Fusilier. Carol and Peter Ramsden’s 13.8k M21E course touched all parts of the map and was cut out by Florian in only just over 5 minutes per km, some 19 minutes ahead of Bill Edwards. With Lara and Jenna opting for W20 in the long distance, Marina had her second win of the weekend comfortably ahead of Tessa Ramsden in 2nd. M21E, 13.8k: 1. Florian Schneider 1:13:32, 2. Bill Edwards (HV) 1:32:42, 3. Karl Dravitzki (TK) 1:44:14. W21E, 10.6k: 1. Marina Comeskey 1:29:59, 2. Tessa Ramsden (RK) 1:40:04, 3. Jenni Adams (PP) 1:57:25. M20, 10.6k: 1. Bayley Stephens-Ellison (HB) 1:36:16. W20, 7.3k: 1. Lara Molloy 1:05:54, 2. Jenna Tidswell 1:14:49, 3. Lea Leuenberger 1;19:22. Although consideration was given to extending the 2018 SuperSeries beyond Queens Birthday weekend it has been decided to retain the timing of the last 3 years. Thus, the 2018 SuperSeries will be as follows. There will be Senior (M/W21E) and Junior (M/W20) competitions. Where the Junior courses are the same as the Seniors, Juniors will also earn points in the Senior competition. The best 7 of the 10 individual events will count. In each race points will be allocated as: 1st – 100, 2nd – 80, 3rd – 60, 4th – 50, 5th –45, 6th – 40, 7th – 37, 8th – 35, 9th – 33, 10th – 31, 11th -30, 12th – 29 etc. The Team competition will be based on the results of the ONZ Relay Championships, and the best 3 total scores for each team in the 4 rounds of the Senior competition. The Team score for the ONZ Relay Championships will be the total of the points awarded to the 5 highest placed teams from each region. In each race points will be allocated as: 1st – 200, 2nd – 160, 3rd – 120, 4th – 100, 5th – 90, 6th – 80, 7th – 75, 8th – 70, 9th – 65, 10th – 60, 11th -25, 12th – 24 etc. The Team score for each round based on the Senior individual competition will consist of the sum of the 5 highest individual scores from each race in the round. For the last 3 years the SuperSeries has had medals presented to the winners of both the Senior and Junior competitions. It is recognized however that the SuperSeries would benefit greatly from an enhancement of the teams competition – remember the days of Southern Storm, Central Magic etc.? If there are individuals, clubs or even businesses who would like to help by providing sponsorship in some form for this, please do not hesitate to get in touch. The Under 23 Development Camp is now less than 2 weeks away. Based in Palmerston North a full programme is planned for the week of 10-16 December. This will take in sprint training on 3 different areas within Palmerston North itself, four of the sand-dune maps between Levin and Whanganui, some physical training exercises, and a series of talks in the evenings – including a visit from a representative of Drug Free Sport NZ. The week will culminate with camp champs both for sprint and forest orienteering. The final number looks like 35 registrants although there will also be at least 3 trainee coaches working under the guidance of Jean Cory-Wright. The basic aim of the camp is to help young athletes plan their path to elite performance. This means how to prepare physically, mentally and technically for events such as JWOC, WUOC and, ultimately, WOC. The week should build up to discussing the structuring of suitable training programmes, both in the short and long term, for such events. Part of the dearth of information I have on the AOA and WOA Champs is due to the fact that this HP News is being put together in Halden, Norway while visiting Lizzie. My previous visit here was in June 2016 when, although I was aware of the huge number of training opportunities available, it was a rather special time as it seemed that the whole elite orienteering world was either visiting or passing through as they prepared for WOC2016 in nearby Stromstad. Eighteeen months on winter is approaching, the temperature hovers between -5 and +5 °C, and daylight is only from 8 am to about 3.30 pm. Nevertheless there is still a large number of organized training activities/opportunities. These are available for all levels and ages but, from the point of High Performance, it is worth considering what this means in terms of comparison with a typical Kiwi training week and what we are up against when we travel to Europe for WOC, JWOC or even WMOC. 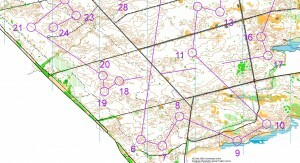 To be sure opportunities are aided by the fact that Halden has both a paid coach, Czech international Eva Jurenikova) and a clubhouse (Høiås) which sits in the middle of about 20 km2 of forest, but what is offered here is not uncommon at any of the major orienteering clubs in Scandinavia. Remember too that these are just the organized sessions and most top juniors and seniors will be supplementing these with their own sessions. Fredriksten Fortress, Halden – the hill intervals zig-zag up a road/path leading to the top. Monday gives club members the option two sessions of strength training at a local school. The one hour session incorporates everything from high intensity aerobics and running drills, to balance exercises, and core body strength. Tuesday sees night orienteering training, sometimes held as an event, and using a variety of different areas. Wednesday is either a hill, track or terrain interval session in the evening. 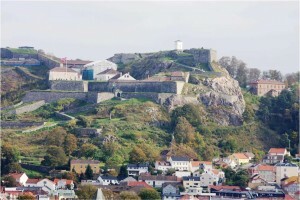 Hill intervals are held on the slopes of Fredriksten Fortress (scene of a major Norwegian-Swedish battle in 1718, as well as a sprint relay in the 2015 IOF World Cup). On Thursday there is a club night at Høiås. Earlier in the autumn something like 100 reflector controls were put out over the entire area of the surrounding forest and it is these controls that form the basis of different exercises over the course of the winter, not just for the elites, but for the whole club from 5-80+yr olds. The clubhouse itself, which has been in existence for over 100 years, has changing rooms with showers and sauna, a full kitchen, plenty of seating areas, and a wall of fame containing photos of all the Halden World Champions. Throughout the year there is a roster of people to prepare and sell food (e.g. Norwegian waffles) post training. Friday has an orienteering theory session for the students at the local school (and club members who want to join) who take orienteering as an elective subject, but it is Saturday that sees the major daytime organized session. 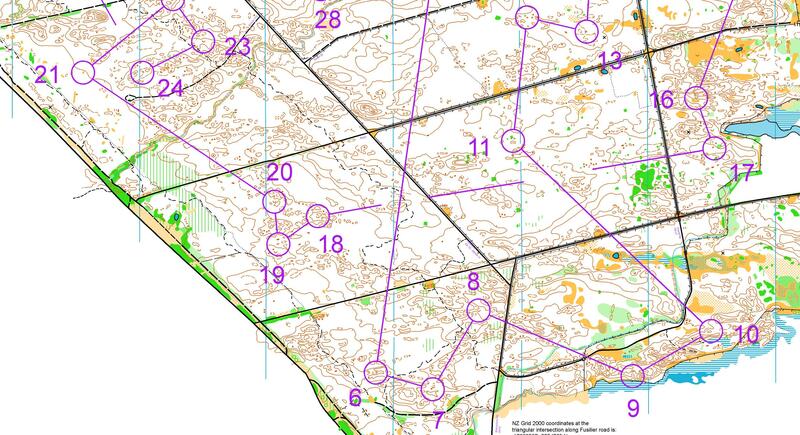 This moves around the club’s many maps, but for example, for the week I was there involved an approximately 1 km line course, followed by a series (5) of O-intervals each of about 4-5 controls and totalling nearly 8 km in length. The ground had a light covering of snow, the marshes were generally frozen, but the turnout among the juniors and elites was large. What is more it was a new map – no saving of the new areas for competition, if it’s good train on it. Another interesting point is that the club has its own set of GPS units so that all the major training exercises have tracking which can be used for post-training analysis. Sunday, of course, is the long run, although the clubhouse is also open for more of the waffles. This kind of programme runs right through to about May-June when the major international season starts to kick into gear. Additionally though there is a yearly club spring training camp, often in Portugal or Spain in early February, although in 2018 in advance of the European Championships it will be in Switzerland. In many ways the major differences between Halden (and other Scandinavian clubs) and New Zealand are in, firstly, the degree of organized physical training which is available – and no-one can really argue that physical training is much easier in a group environment than individually – and, secondly, the amount of technical training that is possible. In part that is because of the essentially open access of most terrain compared to New Zealand where permission has to be sought for every access. Nevertheless, the pointers are there as to how we perhaps need to improve our organization if we want to be routinely competitive at the top level.